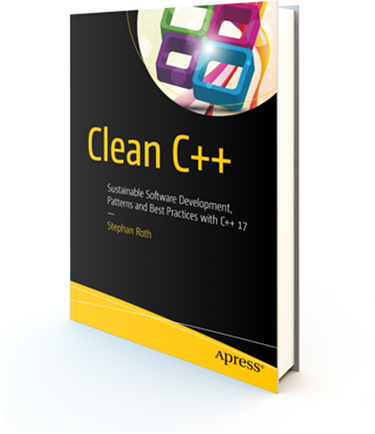 Welcome to the companion website of my book Clean C++ – Sustainable Software Development Patterns and Best Practices with C++ 17 (Apress). This website provides additional material on the book. For instance, you can download all figures from the book in high resolution, just follow this link. Furthermore, there is a discussion forum. It is the right place to provide feedback, ask questions, or discuss the topics of the book. Any meaningful feedback is greately appreciated. Occasionally I will also blog here. Even after the publication of my book, the programming language C++ continues to develop (the work of the ISO standardization committee on the C++20 standard has already begun! ), and there are a couple of topics that didn’t make it into the first edition. Thus, some articles will appear in the blog category of this website soon. Known typographical and other errors are regularly published on the Errata page after they have been found. By the way: This book also has a Twitter account, the handle is @cleancpp. Follow this account to be kept up to date with the latest news. Finally, I would like to say thank you for purchasing Clean C++. I hope you enjoy the read!